A great landscape plant, FINE LINE® combines the feathery foliage of ‘Aspenifolia’ with the narrow upright habit of ‘Columnaris.’ Use FINE LINE® in narrow hedgerows for privacy, as an accent plant, or even in a patio container. It’s a great vertical accent for the perennial garden, and the narrow habit is perfect for framing entrances. 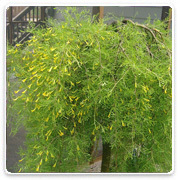 An extremely hardy and drought tolerant variety, the lacy, bright green foliage highlights this plant's graceful, weeping form that consists of stems and a trunk with shiny golden bark. Tiny, soft yellow, pea-like flowers add further charm in early June. 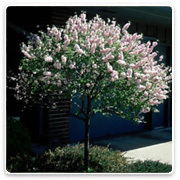 Irregularly spreading branches of this diminutive tree are smothered in spring with excellent, bright pink flowers. Dwarf character and abundant crop of bright red, persistent fruits hint at its origin as a Sargent seeding. The Camelot® Crabapple tree, Malus 'Camzam', is a dwarf cultivar that has a rounded shape and thick, leathery, dark green leaves with a touch of burgundy. The flowers are fuchsia-pink on white and produce a rich burgundy colored fruit. The 1/2 inch burgundy fruits ripen in late summer. Best grown in medium moisture, well-drained, acidic loams in full sun, and it does adapt to a wide range of soils. Prune as needed after flowering, but before June. This is a weeping, spreading, deciduous tree. Leaves are ovate, often lobed, dark green, up to 3 inches long. Red buds produce pale pink blooms, followed by yellow fruit. This tree does well in most soil, but will be more attractive if fed peat and compost. 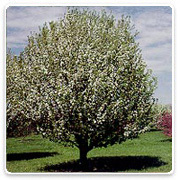 Spring Snow Crabapple has a very dense upright oval crown. 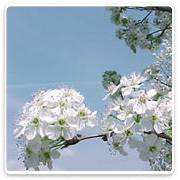 It is one of the most showy white flowered crabapples with very abundant flowers that are slightly larger than most crabs. 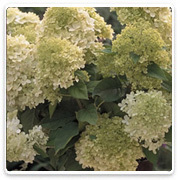 It does not produce fruit which is a valuable trait for planting in patios or over sidewalks. 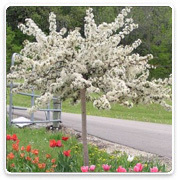 The Sargent Crabapple tree, Malus Sargentii, is a dwarf flowering tree that flowers profusely in early spring with pink to white scented blossoms. Excellent for wildlife because of its edible dark red berries. Summer foliage is a dark green color. 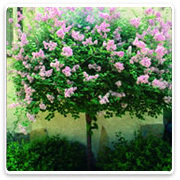 It is used as a specimen or patio tree. 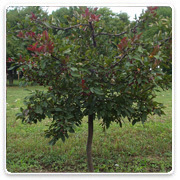 This deciduous tree has moderate water requirements and a moderate tolerance to salt and alkali. 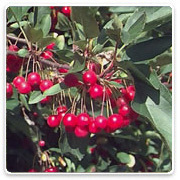 One of the smallest crabapples, it is a mounded, wide spreading tree, (wider than high), with disordered branching and frequent cross branching. Flowers are white, red when bud is opening. The fruit is bright red. This crabapple has the smallest leaves of all the crabs. 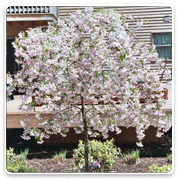 Sargent Crabapple trees are know for their stunning flowers. A dwarf flowering crabapple. Great for small spaces. Persistant fruit. This is a semi-weeping, spreading, deciduous tree. Leaves are ovate, often lobed, dark green, up to 3 inches long. 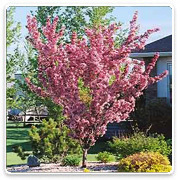 Red buds produce pale pink blooms, fading to white as flowers mature. Followed by red fruit approximately the size of a cherry. This tree does well in most soil, but will be more attractive if fed peat and compost. 'Thunderchild' produces single, pale pink buds, opening to white flowers, followed by dark red to purple fruit on a compact, upright, spreading, broad to oval to rounded tree. 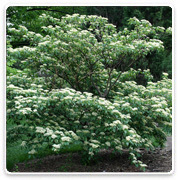 Pagoda Dogwood is an excellent small tree or large shrub that can be grown either as a single or multi-trunked specimen. General crown form is oval to round but it has a unique horizontally layered branching structure which accounts for its common name. It has 3-4" flat clusters of small white flowers in spring. Fruit are small blue-black berries that add considerable color in summer as they mature. The fruit are readily eaten by birds. The fall foliage color is a deep burgandy. The plant form adds a great deal of interest to the winter landscape. Pagoda Dogwood is native to much of the upper midwest where it is found as an understory plant in wooded areas. Lilac, Dwarf Korean on Std. The Tree Lilac, Syringa reticulata, 'Ivory Silk' is a heavily flowering tree, covered by large plumes of small white flowers in the beginning of summer. 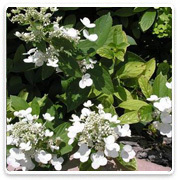 It’s dark green leaves blending with it’s fragrant white flowers are a favorite for spring-time landscapes. 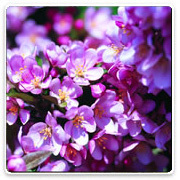 Lilac lovers prefer the mutiple-stemmed, large shrub. Rich, dark red foliage all summer turning to brilliant scarlet in the fall. More cold hardy than other Japanese Maples. Well suited to be a small lawn tree. Little pruning is generally needed. Prune undesirable or damaged branches as needed. 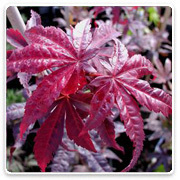 Be one of the first gardeners to have the new Japanese Maple 'Shirazz'. The leaf color is unique: a complex blend of lovely pinks, greens, and creamy-white with new growth emerging as striking crimson-pink with autumn tones of scarlet. The Callery Pear tree, Pyrus calleryana, 'callery X Aristocrat cultivar', is a tight, narrow, pyramidal, thornless, ornamental pear tree. Some specimens appear almost columnar in habit. Oval, glossy green leaves turn an attractive reddish purple in autumn. The growth habit is dense, narrowly pyramidal, and evenly branched with crisp glossy green foliage. New growth shows a reddish tint. 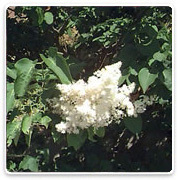 It has a heavy abundance of single white flowers in the spring and outstanding reddish-orange to purple fall color. Double Flowering Plum, 'Prunus triloba', is a hardy, vigorous growing, large shrub that is noted for its double pink flowers produced in profusion in April-May. These fully double hot pink flowers completely smother the branches in early spring long before the leaves emerge. It is a showstopper in May across in northern areas! 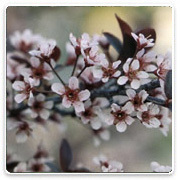 Double Flowering Plum forms a rounded shape with medium green foliage in summer, and then develops a yellow-bronze fall color. It grows 10-12 feet in both height and width. Plum, Purpleleaf, Sandcherry on Std. The Red Bud tree, Cercis Canadensis, is also known as the eastern red bud, and sometimes referred to as the Judas tree because it dates back to biblical times. 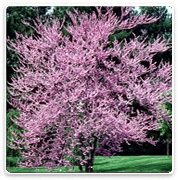 It is a small deciduous tree that displays an abundance of purple blossoms in the spring. It has large heart shaped leaves during the summer, and long seedpods in the fall. Red Bud trees have a yellow fall color. These trees are effective as a single specimen, in groupings, in a shrub border, and especially nice in woodland and naturalized type situations. It has low water requirements and displays a high tolerance to salt and alkali soils. Willow, Arctic Blue Leaf on Std. 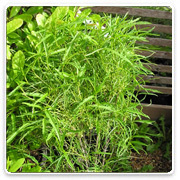 The Dwarf Blue Leaf Arctic Willow, Salix purpurea 'Nana', is a fast grower and it will tolerate wet soil conditions. 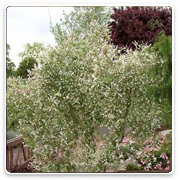 This shrub provides quantities of slender, upright stems which makes for a soft looking shrub which waves beautifully in the wind. To keep it looking it's best, provide regular pruning. The blue-green leaves are very attractive on the mounded shape. A fine textured shrub. Willow, Dappled Hakura Nishiki on Std. A real show stopper! 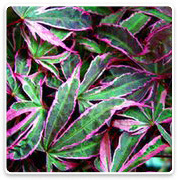 Bright pink shoots which open to creamy white and green variegated leaves. Heavy fertilization will maintain it's color. 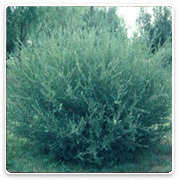 This shrub can also be trained into a small tree and can usually be found in shrub and tree form. Catkins bloom on the stems of this plant in early April. Grows 12-18" per year.